Minnesota Wild General Manager Chuck Fletcher today announced the club has acquired center Darroll Powe from the Philadelphia Flyers in exchange for the club’s third-round pick in the 2013 NHL Entry Draft. 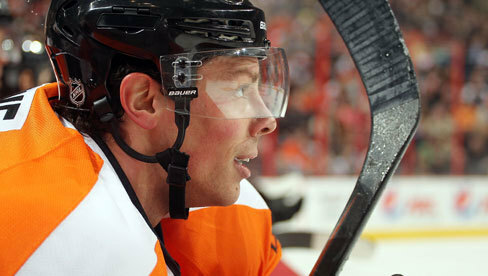 The 26-year-old registered 17 points (7-10=17) and 41 penalty minutes in 81 games for Philadelphia in 2010-11. Powe led the Flyers and ranked tied for 21st in the NHL with 196 hits last season, while also setting career-highs in assists and points. The 5-11, 212-pound, native of Saskatoon, Sask., skated in three NHL seasons with the Flyers and owns 43 points (22-21=43) and 130 PIM in 204 career games. He recorded five points (1-4=5) in 40 Stanley Cup playoff contests and appeared in the 2010 finals versus Chicago. Powe signed with the Philadelphia organization as a free agent coming out of Princeton University (ECAC). During his four-year career at Princeton (2003-07), he played in 120 games, tallying 60 points (28-32=60) and 180 PIM, and served as team captain as a senior. He was also awarded the Richard F. Vaughan Cup for perserverance and dedication to Princeton hockey in 2006 and 2007.